Make sure that all of the answer choices are unambiguous, and avoid trick questions. Checkbox problems with ambiguity can be frustrating to learners, especially if the problems have a limited number of attempts. You can create checkbox problems in the simple editor or in the advanced editor. You can set up a problem in the simple editor, and then switch to the advanced editor to add more configuration options in XML. However, you cannot switch back to the simple editor from the advanced editor. Therefore, you might want to format the problem as completely as possible before you begin to use the advanced editor. Select one of the two checkbox problem templates. From the list of Common Problem Types, select Checkboxes. From the list of Common Problems with Hints and Feedback, select Checkboxes with Hints and Feedback. For more information, see Use Feedback in a Checkbox Problem. Studio adds the checkbox problem to the unit. 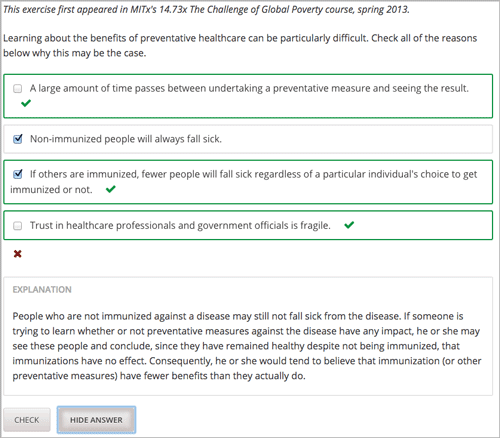 Edit the text to place each answer option on a separate line. Select the set of answer options, and then select Checkboxes from the toolbar. A pair of brackets appears next to each answer choice. To identify each correct answer, add an x between the brackets for that option. For the example problem illustrated above, the following text displays in the problem component. [x] A large amount of time passes between undertaking a preventative measure and seeing the result. [x] If others are immunized, fewer people will fall sick regardless of a particular individual's choice to get immunized or not. [x] Trust in healthcare professionals and government officials is fragile. To use the advanced editor to edit a checkbox problem, follow these steps. You can add feedback in a checkbox problem using the simple editor or the advanced editor. For an overview of feedback in problems, see Adding Feedback and Hints to a Problem. In checkbox problems, you can provide feedback for each option that a learner can select, with distinct feedback depending on whether or not the learner selects that option. This means that there are four possible types of feedback. For problems with more than three options, providing specific feedback for each combination can become difficult. For such problems, you can define compound feedback for more likely combinations of option or for combinations of option that reflect common learner misunderstandings. If you do not define feedback for a combination that a learner selects, the learner receives feedback for the individual selections. You can configure individual option and compound feedback in the simple editor. When you create a new checkbox problem, select the template Checkboxes with Hints and Feedback. This template has example feedback syntax that you can replace. In the simple editor, you configure individual option feedback with the following syntax. For example, the following problem has feedback for each option. Feedback for when learner does not select this answer. tomato plant and contains seeds it is classified as a fruit. In the advanced editor, you define compound feedback in the <compoundhint> element within the <checkboxgroup> element. Feedback when learner selects this combination of answers. they all are fertilized ovaries of a plant and contain seeds. a plant in tuber form and is classified as a vegetable. You can add hints to a checkbox problem, using the simple editor or the advanced editor. For an overview of hints in problems, see Adding Feedback and Hints to a Problem. There are two ways to award partial credit in a checkbox problem. You can configure a checkbox problem so that the learner’s response for every option is evaluated and scored. This is known as “every decision counts” (EDC). With EDC, for each option the learner gets wrong, either by not selecting a correct option or selecting an incorrect option, the learner’s score is reduced by 1/n, where “n” is the number of options. 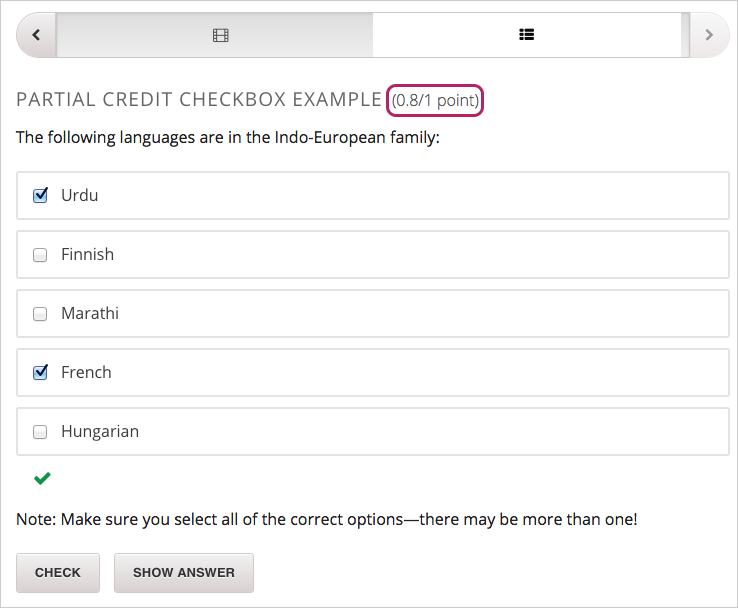 For example, if there are four options, each one is worth 25% of the total score. If a learner’s response is wrong for one option, she receives 75% of the points for the problem. The following table describes the learner’s score for different submissions for EDC problems with a variety of correct answer options. To configure an EDC checkbox problem, you add the partial_credit="EDC" attribute to the <choiceresponse> element in the problem XML. For example, the following XML shows the checkbox problem template after it is updated to provide partial credit. You can configure a checkbox problem so that for every option that a learner gets wrong, either by not selecting a correct option or by selecting an incorrect option, half of the remaining points are deducted from the learner’s score. This is known as scoring by “halves”. Partial credit using the halves method is calculated as follows. To configure a halves checkbox problem, you add the partial_credit="halves" attribute to the <choiceresponse> element in the problem XML. For example, the following XML shows the checkbox problem template updated to provide partial credit. Feedback when answers A and B are selected. Feedback when answers A and C are selected. <choiceresponse> (required): Specifies that the problem contains options for learners to choose from. <checkboxgroup> (required): Specifies that the problem is a checkbox problem. <compoundhint> (optional): Specifies feedback for a specific combination of answers. <choice> (required): Designates an answer option. Specifies that the problem contains options for learners to choose from. partial_credit (optional) Specifies the type of partial credit given. EDC or halves. Specifies that the problem is a checkbox problem. true (at least one required) Indicates a correct answer. For checkbox problems, one or more <choice> tags can contain a correct answer. false (at least one required) Indicates an incorrect answer. Specifies a hint for the answer option. selected (required) true or false. Indicates if the hint is given when the answer option is selected, or when it is not selected. Designates feedback for a specific combination of answers. value (at least one required) Indicates which combination of selected answers triggers this feedback.